From Zadar we took the ferry across to Preko on the island of Uglijan, another short scenic trip. We used Jadrolina ferries which are the main ferry carrier and charge about 1 euro per kilometre for each passenger (double for bikes), and were very efficient. Very quiet coastal roads led up to a mountain bike track which we thought we’d try and head up for a decent camp. You would have thought we’d learnt by now that the gravel roadsof Croatia are no plain sailing. We did get treated to spectacular views at the top though. The evening was slightly marred by ‘the burnt bum incident’!!! Cooking on rocky ground I was unlucky enough to be sitting just below the cooker when it came to the boil and jolted off the stand to fall next to me. Bolting up, pants down I yelled ‘need cold water’! Of course we were on top of a hill in the middle of nowhere with a limited supply of water for supper and breakfast so had to make do with making a dripping water bottle last 10 minutes, luckily a cooling breeze helped. It would have been quite a site had anyone happened to walk past! First aid kit out and gauze strip on by the morning it looked a little less pink but was quite literally a ‘pain in the arse’ for the next week. The incriminating pot and the beautiful view! Making our way south a small interconnecting bridge takes you to Pasman island where we took awesome local roads and jumped on the ferry at Tkon back to the mainland. 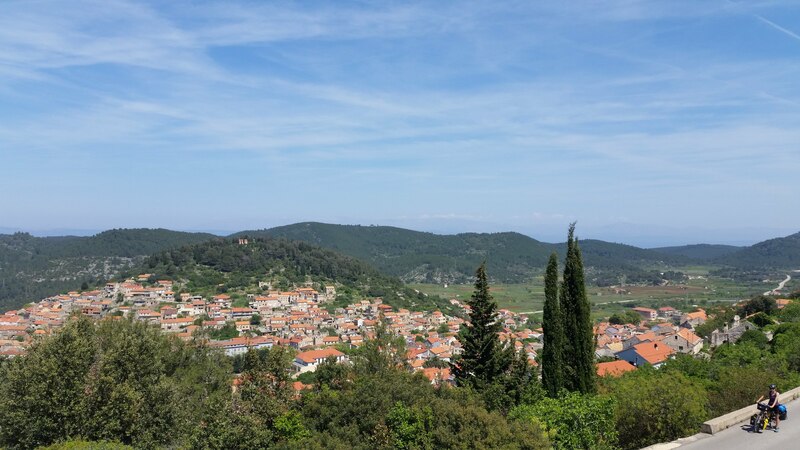 The Croatian countryside was now at its best, winding through olive groves, vineyards and small villages, the landscape is more what I would expect of Italy. 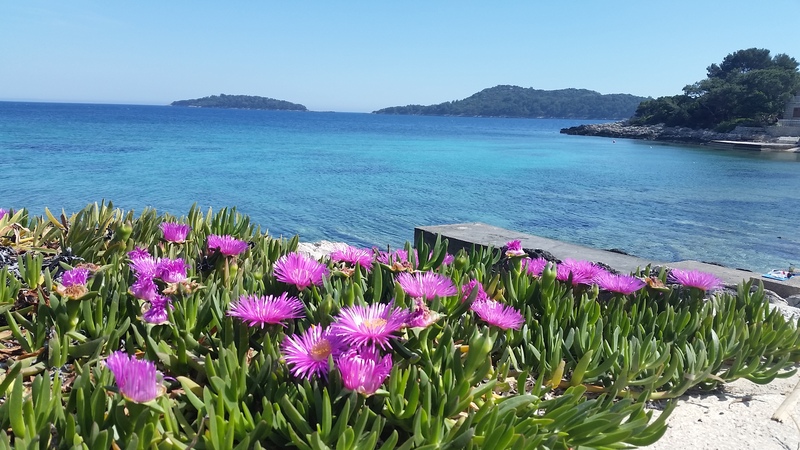 We hit the water again at Zaton, a beautiful village at the end of an estuary. It’s a busy road from Zaton to Sisnek, unfortunately unavoidable but soon escaped back inland. 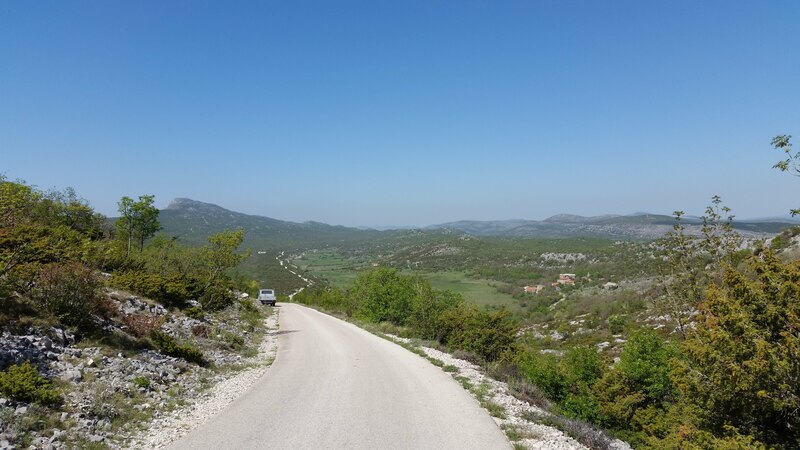 We’d learnt to be wary of gravel roads in Croatia but had our first OSMAnd map fail where a sealed road turned into a grassy field track and then stopped at a railway track. 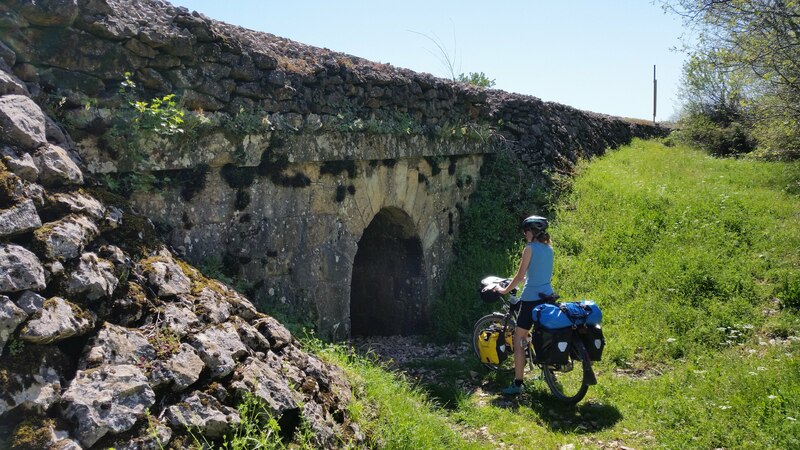 Jules was ready to haul the bikes over when I spotted a small tunnel to the right which led under the track - literally a hobbit hole - which then pops you out in another field to join the main road - phew! The small country roads are beautiful but you really are in the countryside with little opportunity for food and water so we made sure to carry two days food just in case and made sure we learnt the words for ‘water’, ‘please’ and ‘thank you’ and had no troubles, the locals were always more than happy to help! Yes, this is the way! 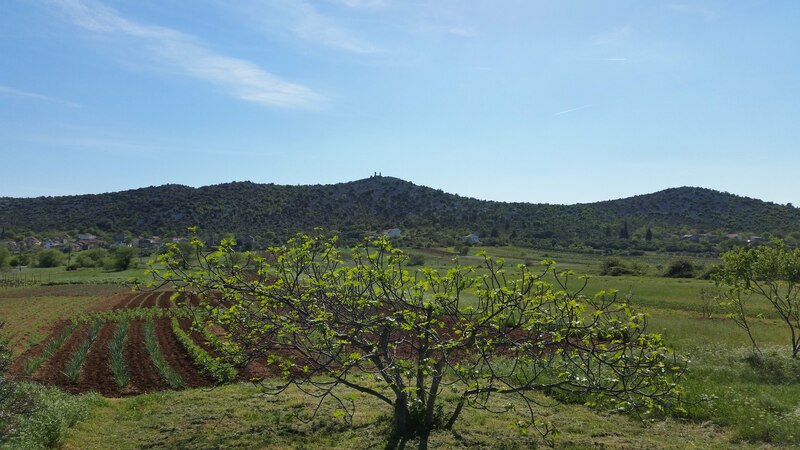 Croatian countryside at it’s best, sadly too early for figs though. The next challenge was finding a quiet route into Split. 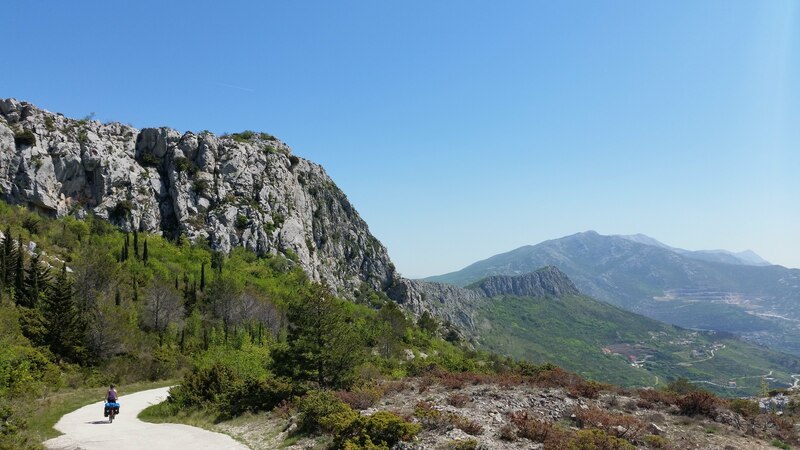 We came through the karst fields at Blaca and then down the mountain, steeply, so steep even Jules admitted he wouldn’t be able to cycle up it. 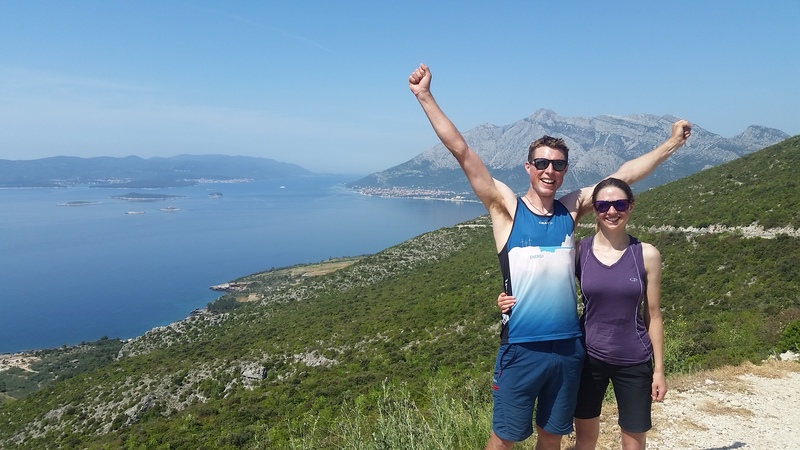 It did however take us into the back suburbs of Split which was not too busy and onto the ferry to Korcula, our last Croatian island. One of the many karst valley expanses that gave temporary relief on the legs before inevitably we had to climb up out of them. All downhill to Split from here! On the ferry we bumped into Sara, Antoine, and baby Sacha who were also on a long cycle tour. It was so good to share a beer and some stories with them. We followed a similar route through the rest of Croatia and bumped into them a few more times. 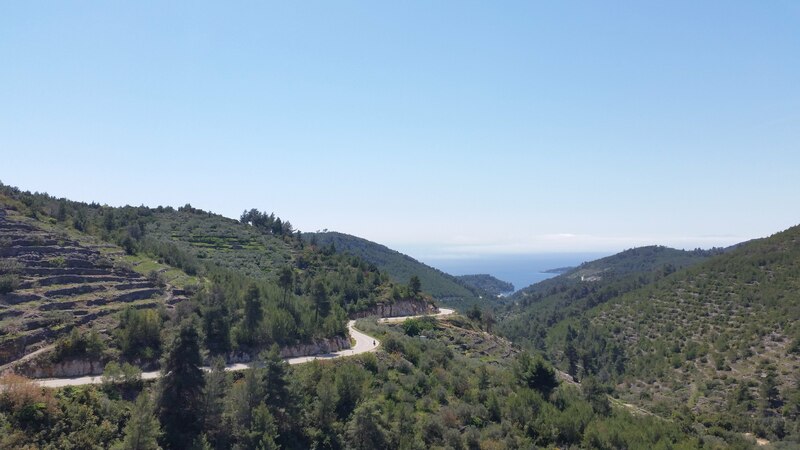 After a night in Vela Luka, we had one of the best cycling days on tour, up and over to the south of the island - olives, wine, beaches, sunset on the cliffs, what more could you want, a truely stunning ride. 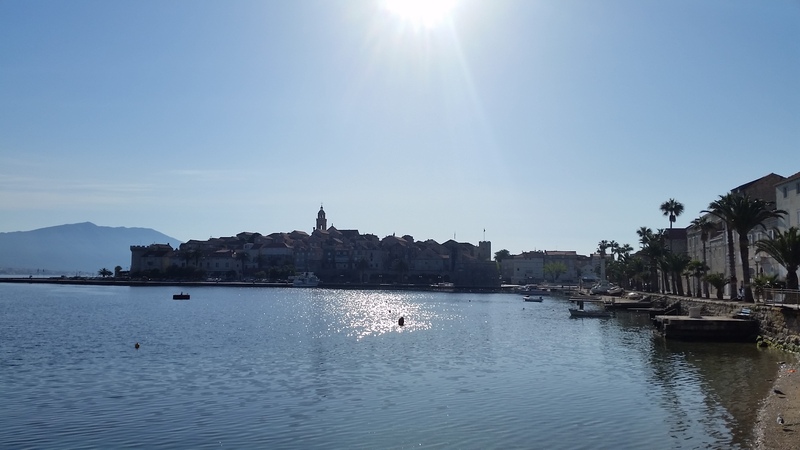 Sadly a day was all we had on Korcula. The ferry takes you to Orebic where it is all uphill from there, 400m climb in a hot dry heat, before you have to drop down to the coast again. The views were pretty good though and the road took us to Ston where we were surprised to see a ‘Great Wall’ the Walls of Ston which rose up the hill, 5.5kms long and are also known as the ‘European wall of China’. 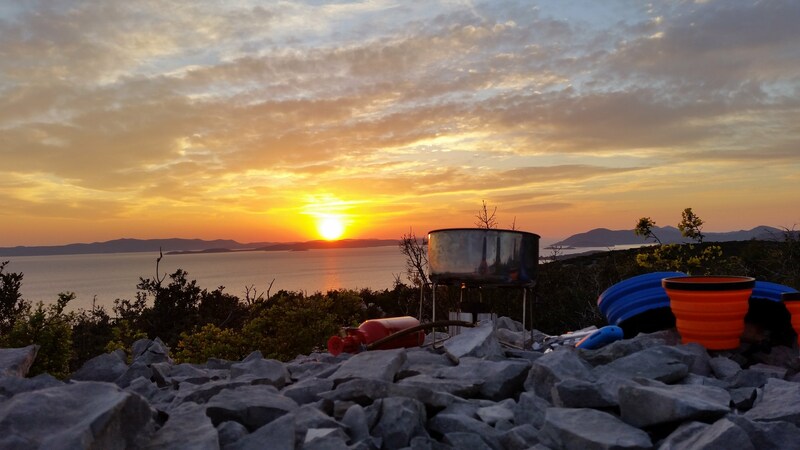 The final challenge was leaving Croatia! We had been told that some of the border crossings were for locals only, so decided to try the route from Slano which is a decent secondary road on the map, but to no avail. so a 8km round trip detour we plodded on towards Dubrovnik. 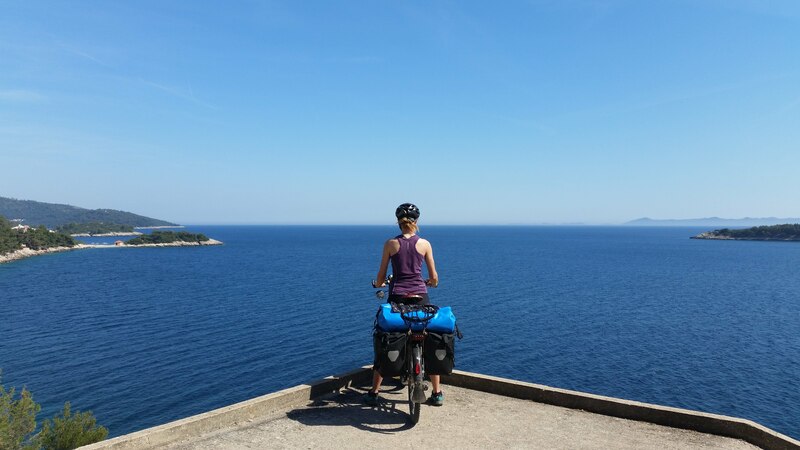 Jules found a really good route which stayed high above the coast and passed through the small villages of Majkori, Mravinjac, Mravo and Ljubac and then avoiding most of the busy coast road into Dubrovnik by going under the bridge. The road up to Brgat was a bit busy, but from there across to the border a quiet uphill traverse to the international border at Ivanica.